Last week I finally made it down to Oahu, Hawaii and stayed at the beautiful pink resort, The Royal Hawaiian. Located in the heart of Waikiki, The Royal Hawaiian, a Luxury Collection Resort is the ideal starting point to any adventure in Honolulu. This was not my first time to Honolulu. As a kid, growing up in Los Angeles, I would go to Hawaii during the Summertime. I remember seeing the huge pink hotel and calling it the "Princess Hotel". Needless to say, I still think it's fit for a Princess, and I absolutely loved my stay at The Royal Hawaiian, especially the location! The lobby of the hotel is a very large and open, outdoor lobby with a nice breeze blowing through it. Upon arrival, I was greeted with a gorgeous purple orchid lei. After check in, I decided to walk around the "Main Strip" on Honolulu, called Kalakaua Ave. The hotel is surrounded by hundreds of retail stores on one side, and the beautiful white sands of Waikiki Beach on the other, what more could you ask for?! I had the Historic Ocean View Suite with views of the majestic Pacific Ocean, and Diamond Head. I enjoyed eating breakfast with a view at Surf Lani. The Surf Lanai is an upscale outdoor beach side restaurant positioned alongside the pool providing al fresco breakfast and lunch service. The "Pink Palace Pancakes" were my favorite, I ate them every morning! My travel essentials are Burt's Bee's BB cream, and the grapefruit facial cleansing wipes. I don't travel without them! My Jeep Wrangler rental for a day of adventures. Outfit by Misa LA. On the second day, I rented a Jeep Wrangler to explore the east side of the island. A lot of people may be scared at the thought of renting a car and driving around an unfamiliar island, but It was so easy to do, and extremely fun! I always love a good adventure, and I really enjoyed driving through Oahu, and along the eastern coast. The views are stunning and definitely worth seeing! Plus, it's almost impossible to get lost (I used a paper map, so '90's, I know!) because there are only so many ways to go. The Royal Hawaiian concierge was so nice to suggest cool spots for me, and even marked it out on a map. I am actually really good with finding places and really good with directions. (I am old school and use the sun and moon.) I suggest just using the navigation on your smart phone, or the car's navigation system If it comes with it. The first stop was Pali Lookout. The panoramic view is probably one of the most gorgeous views I have ever seen! It overlooks Nu'uanu Valley. The next stop, was "Valley of The Temples Memorial Park". This location is stunning and like nothing I've every seen before. Thousands of Buddhist, Shinto, Protestant and Catholic residents of Hawaii are buried in this memorial park. It was founded by Paul Trousdale in 1963. The whole area is very quiet and serene. There aren't very many people walking around, just many tombstones- every kind of religion. Every corner is picture perfect, and the higher you drive up, the closer you are to the mountains. Dress by ASTR The Label. The main reason why I wanted to visit The Valley of the Temples, is because of the famous red temple, called The Byodo-In Temple. You have to drive to the top to get to the Byodo-In Temple, but it is so worth the drive. The views get better the higher up you go. There were plenty of places to stop for lunch after leaving the Valley of The Temples Memorial Park. 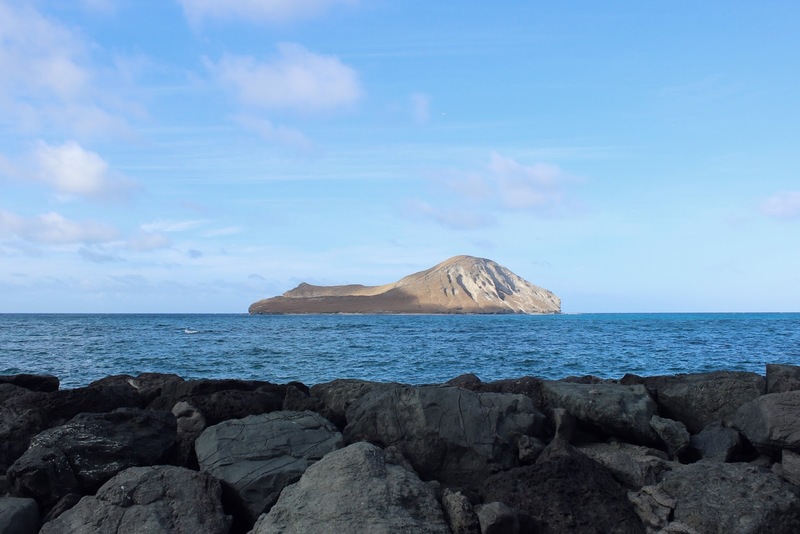 After a quick lunch, I drove to the third stop, Makai Research Pier, which has a secluded beach and views of smaller islands in the distance. Bikini by Perfect Peach Swim. Fringe Coverup by Luli Fama. The final stop was a very rocky beach scenic spot called, Lanai Lookout. Lanai lookout is right off of Kalanianaole Highway, just a few miles before you head back into Honolulu. Words cannot describe how beautiful this beach was. The rocky cliffs and the rock formations were so untouched and unique. I even managed a few snapchat selfies on the edge of the cliff. If you climb all the way to the bottom, there are caves you can take pictures in. But, the sun was going down, and I didn't want to get stuck down there in the dark. Thank you again to The Royal Hawaiian for having me! This trip was filled with fun adventures, and pictures that will last a lifetime. We attended an event here this past Sunday & had an awesome experience from beginning to end. They served great food and the salad I had for dinner was delicious. The service at New York venues also was impeccable.